What better way to discover the Broads National Park than by joining Broads Tours for a scheduled river trip. All trips include an entertaining live commentary; your skipper will explain the origins of the Broads as he points out the sights of interest including the abundance of wildlife. Light refreshments, licensed bar and toilet facilities are available on all river trips. Our daily timetable of river trips runs from 1st April until 31st October. Please see our website for our full timetable of sailings. A limited number of wheelchair users are welcome on all of our sailings. Advance booking is recommended to avoid disappointment. Coach parties and groups are very welcome. We offer generous group discounts and free coach parking. Minimum 15 people required for group discount. Choose from a lively Boogie Evening every Wednesday and selected Fridays, or enjoy live jazz music on a Tuesday or a Thursday evening. Please book to avoid disappointment. We run other events from Easter Specials to Kids Go Free in October Half Term. Please see our website for more details. If you are looking for a unique venue for your family party or corporate function you can even charter one of our passenger boats. Please see our website for more details. The winter is not forgotten at Broads Tours either, throughout the weekends in December we host our ever popular Santa Cruises. Santa will land on board the boat with his sack brimming with presents for all of the children on board. (Children aged from 1 -15 years). Please book to avoid disappointment. For the independent explorer Broads Tours also operates a fleet of self-drive Day Boats, Day Cruisers and Large Electrics. A limited number of manual wheelchair users are welcome on all tours. Pre booking recommended to avoid disappointment. Sun 16 Jun Its Father’s Day, Let Dad be Captain for the Day! From the A1151: Located on right-hand sign as you approach Wroxham River Bridge. Hoveton and Wroxham railway station is on the main Greater Anglia, Bittern Line that runs from Norwich to Sheringham. Broads Tours is a short walk from the station. There is a bus stop on the Norwich Road in front of Broads Tours. 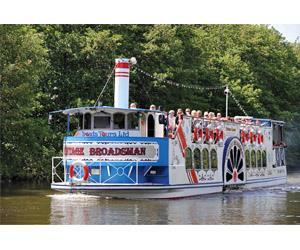 Broads Tours offers a 10% discount off the cost of a river trip for all passengers arriving by public transport. Valid ticket needs to be shown.